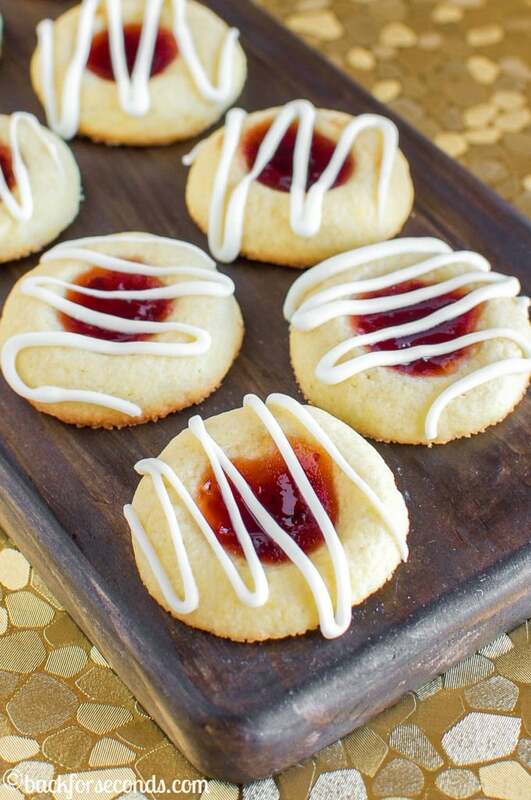 Cornmeal Thumbprint Sugar Cookies with Strawberry Jalapeño Jam, and a white chocolate drizzle, are a so full of flavor that will delight your tastebuds! I am so excited to share this recipe with you today!! These cookies are unlike any you’ve ever had before, and if you are anything like us, you won’t be able to stop eating them! 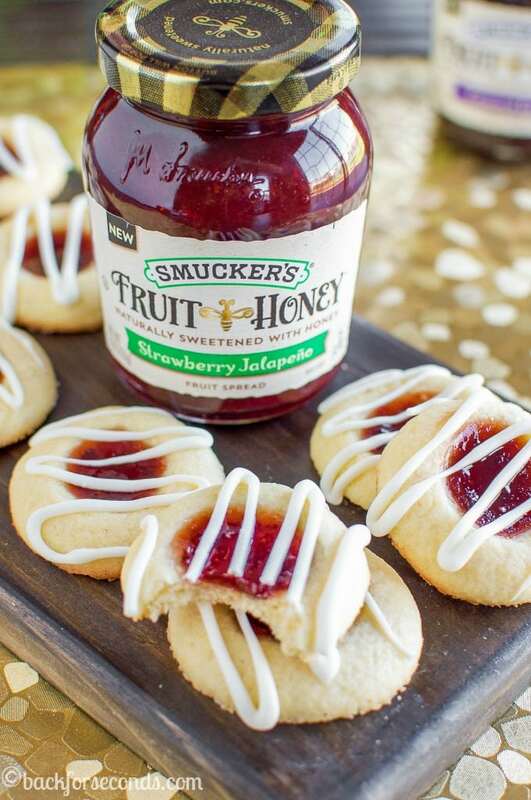 Have you tried Smucker’s Fruit & Honey™ Spreads? They are so so good!! Ripened fruit sweetened with honey. Pure, simple, and crazy delicious! Well, they have a Strawberry Jalapeño flavor and it is awesome. I knew I had to bake something special with it! Instantly the idea for a cornmeal thumbprint cookie came to my mind. Sweet, spicy, and totally unique! I practically raced to the kitchen to see if I could make them taste as good as they did in my imagination. You guys!!! The cookie dough alone is so good, I had to keep telling my kids to quit eating it so there would be some left to make actual cookies, ha! 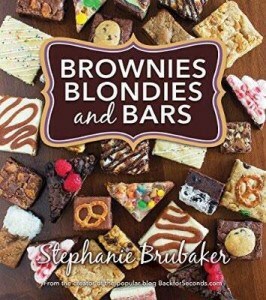 The cookie is like a cross between shortbread and a sugar cookie, with the extra flavor and texture from the cornmeal. They are super tasty and made the perfect base for the Strawberry Jalapeño jam! 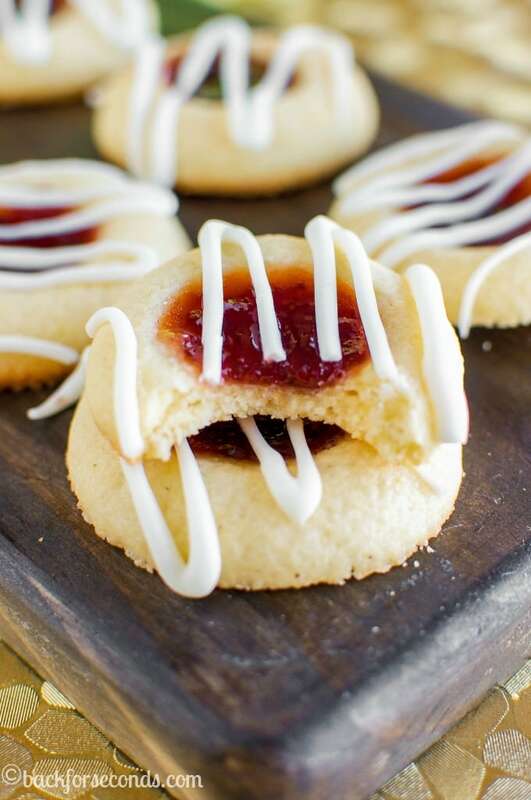 The cookie alone is not too sweet, and the jam has a nice spice to it, so a little drizzle of white chocolate perfectly finished these cookies. These would be such a fun cookie to make for the holidays. They are unexpected and seriously delicious! Hope you enjoy! 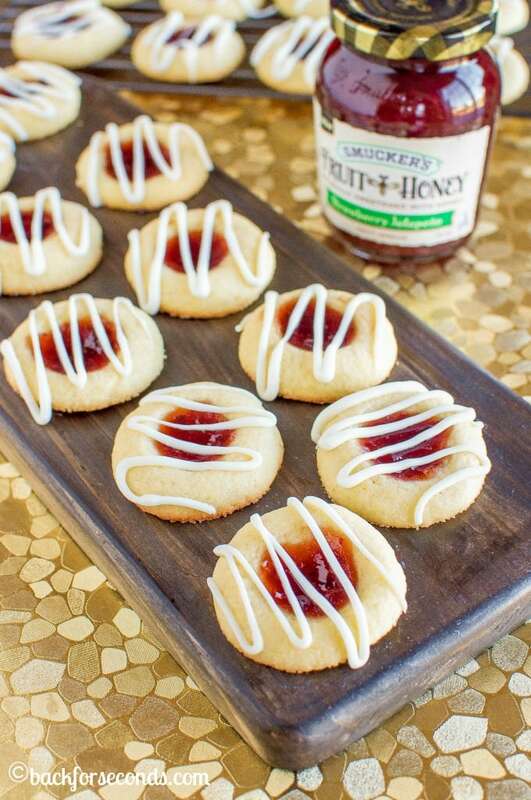 And be sure to check out Smucker’s Fruit & Honey™ Spreads – there are several varieties and they are so yummy!!! 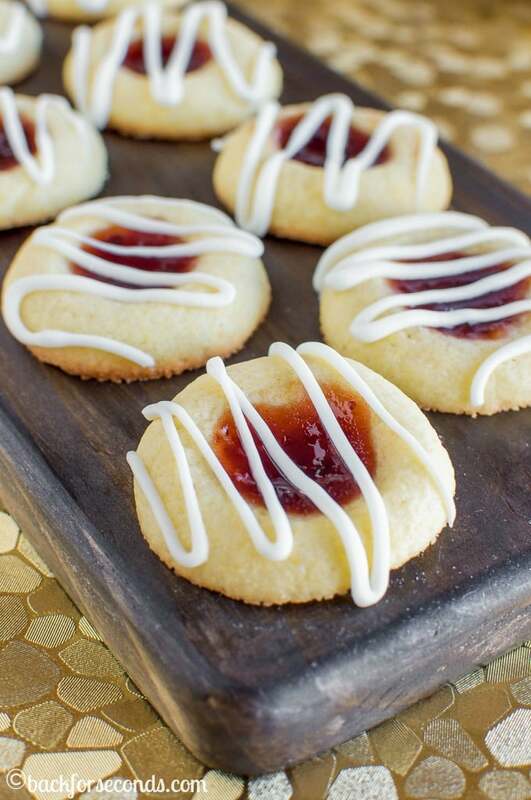 I love thumbprint cookies and am loving this twist with cornmeal and a sweet/spicy jam! Every time I see these fruit spreads, I swear I’m going to try them (especially this one). These cookies sound awesome, I bet that spread is awesome with the cornmeal. 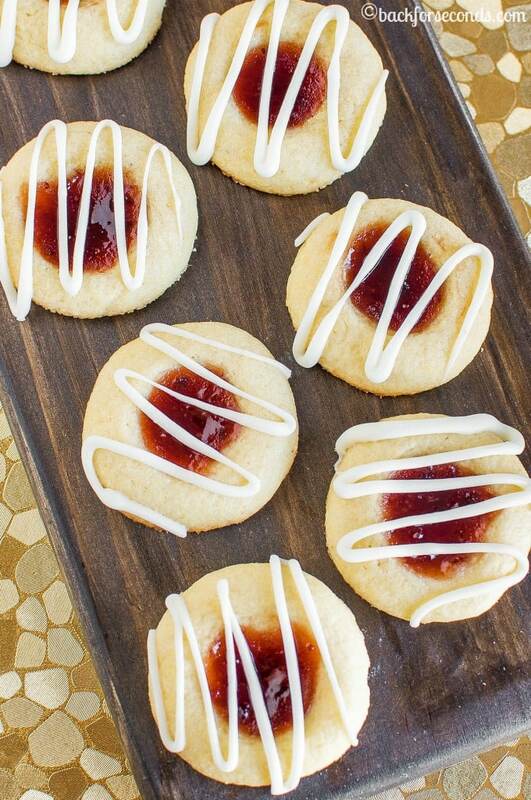 I just love thumbprint cookies! 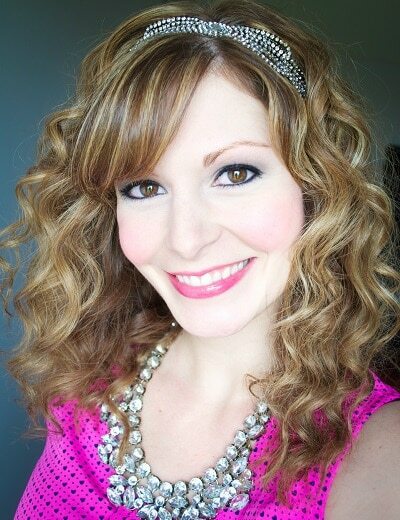 So pertty! Loving the kick to the jam! These are right up my alley! Thumbprint cookies are my favorite!!! These look delicious! How awesome that these fruit spreads are sweetened with honey! And those thumbprints would go really well with the latte I’m drinking right now. I am BONKERS for these cookies. First I am a cookie monster…legit! And second, strawberry jalapeno jam??? I am so picking up some of that!